I’ve always believed in the concept of intentional living. It’s deepened relationships with my family, fueled my passion for my nonprofit organization, The Lynn Sage Foundation, and led me to open Chill. The more I check in with myself to reexamine, recommit, or refine my intentions, the more fulfilled, focused and less anxious I am. And despite the hectic pace of the end of the year, it is a perfect time to take stock and reflect on all that’s come to pass. Which is how I ended up at a mindful meditation retreat in New York just a few weeks ago. This dedicated weekend away helped me enter the new year with renewed purpose and refined focus. As the co-founder and owner of Chill, I’m always intrigued by new meditative techniques and formats. 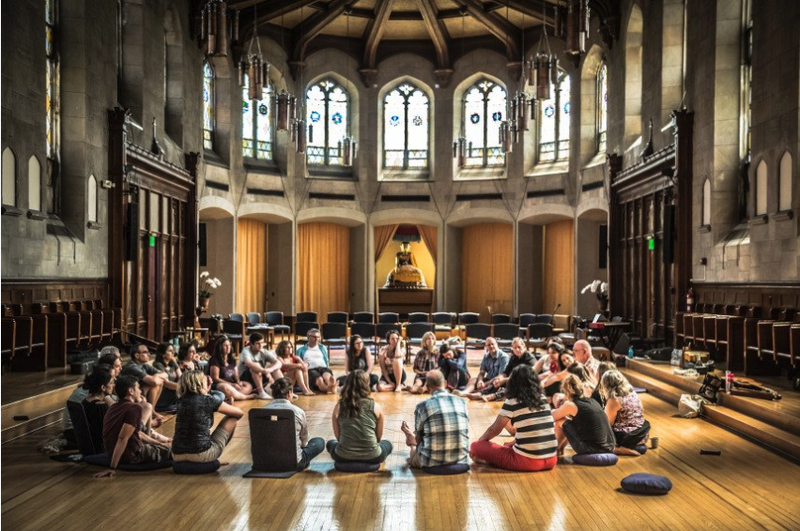 The Garrison Institute’s Winter Solstice Meditation Clinic did not disappoint. 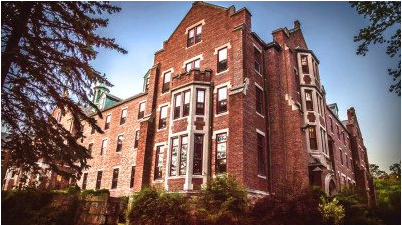 An established mindfulness center, Garrison attracts pioneering instructors like Sharon Salzberg, Jack Kornfield, and Tara Brach. The Institute’s mission to inspire thinking and thoughtful action especially appealed to me. This particular weekend was hosted by Jane and Derek Kolleeny, directors of the Westchester Buddhist Center. I was introduced to The Garrison Institute like most things in life — timing + email marketing. I “attended” a webinar panel discussion this fall featuring Richard Davidson, Jon Kabat-Zinn, and Daniel Goleman presenting of The Untold Story of America’s Mindfulness Movement. Garrison was a supporter of the conference, which was also backed by one of my all-time favorite stores / restaurants / meditation rooms, abc home. There was so much to love about this collaboration that it inspired me to visit The Garrison Institute in person when the opportunity arose. The retreat format appealed to me — the two-night length was right, I’d be close to my family living in NYC, and the promise of good food sealed the deal. It was even conveniently timed before my annual family vacation. This was the right mindful meditation retreat for me, so I headed east. Who do you meet on a meditation retreat? The short answer is all kinds of people. Some expected, some not. The retreat leaders are students of Chögyam Trungpa, a charismatic Tibetan Buddhist, whom they met about forty years ago in Colorado. Trungpa passed away several years ago, and his practice was not without controversy. But there’s no disputing his influence and successful promotion of Buddhism in Western cultures. The retreat centered on his book, Mindfulness in Action, although the Kolleenys stayed focused on the basics. I joined about forty other students, spanning all ages and backgrounds. Attendees included everyone from a Brooklyn woman who had leaned on mantra meditation during her Mt. Everest climb and several people in academia to a New York state politician and at least one neuroscientist. Many practice yoga, as evidenced in two yoga / meditation sessions, and all seemed highly intellectual, kind, and self-reflective. I was happy, although not surprised, to make these observations. Creativity, self-awareness and vision are traits I’ve noticed in devoted meditators over the years. In fact while on retreat, my brother-in-law shared this timely Inc. Magazine article highlighting fluid intelligence traits and how meditation helps increase IQ. This concept isn’t completely new to me, but Derek’s instruction allowed flexibility in the practice and I ended up really enjoying the exercise. Simply maintain an unfocused gaze, which helps preserve a sense of community and helps fend off fatigue, a common hindrance for many (including me!) while meditating. Resting your eyes or closing them when needed is perfectly acceptable. I’ve always been an advocate of incorporating physicality into meditation, especially for beginners, so I really liked this practice. Movement helps the brain focus and can be incorporated several ways. For example, I find it much easier to maintain focus on the cushion after thirty minutes of yoga during Chill’s yoga + meditation class. Even small motions help lower your heart rate and take off the edge. In a recent RadReads podcast, my former colleague in the hedge fund space, Khe Hy interviews Positive Intelligence author Shirzad Chamine. He advocates rubbing your thumb and index finger together for as few as ten seconds when in the midst of a stressful situation that doesn’t allow for a meditation time-out. It’s small, tangible everyday tools like these that really work to keep us centered. Lucky for me, Jane said reading is absolutely acceptable… although, I did feel like I was cheating a bit. During my first silent meal, I was engrossed in the personal journey of Yael Shy in What Now? The founder of MindfulNYU, Yael had just hosted a meditation session and book signing at Chill and I was eager to learn more. I tried to join a silent table for our second meal, only to find that my fellow retreat members weren’t so silent. Back to Yael I went, without reservation now that Jane had given the thumbs up that reading is ok. Overall, The Garrison Institute’s retreat was the right tone and pace for me. But beyond my personal experience, it’s inspired us at Chill to work toward facilitating a retreat this spring. If you have experienced a mindful or yoga retreat, what resonated most with you? What locations are appealing? What is the right length? Are there specific topics you would like covered or techniques you want to learn? We always appreciate feedback from our community as we explore new experiences that will, hopefully, deepen our commitment to living with intention.